The East Asian Religion subfield in the Department of East Asian Languages and Civilizations at Columbia University boasts one of the largest and strongest faculty cohorts in North America. EALAC faculty specializing in East Asian Religions include Bernard Faure (Japanese Buddhism), Michael Como (Shintō and Japanese Religions), Max Moerman (Japanese Buddhism), and Yang Zhaohua (Chinese Buddhism and Daoism). Students in the program are expected to work closely with each of these professors during their time at Columbia. 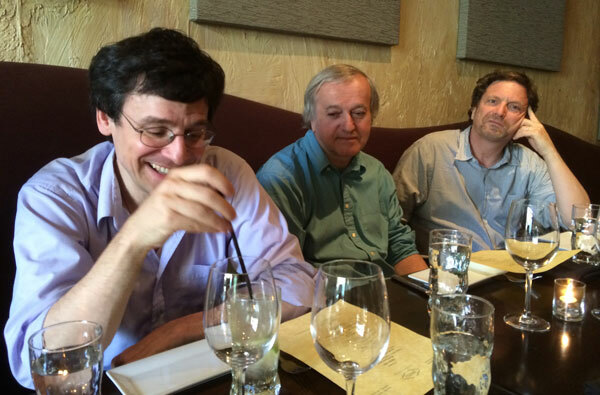 Professor Michael Como, Bernard Faure, and Max Moerman at annual EALAC faculty dinner. Students trained in the program are given extensive training in two principal areas, each of which draws upon the unusually deep resources provided by the Department of East Asian Languages and Cultures as well as the Department of Religion at Columbia. First, students are given extensive training in the cultural, linguistic and textual traditions relevant to their areas of research. Students are expected to develop proficiency in both classical and modern forms of at least two Asian languages. Thus students of Japanese religious traditions frequently work not only with instructors in Columbia’s language training programs, but also with such specialists in early Japanese literature and culture as Haruo Shirane and David Lurie. Students of Chinese religious traditions, similarly, often work with such specialists in Chinese literature and history as Robert Hymes, Shang Wei and Guo Jue. Students are also welcome to pursue studies in Columbia’s pre-eminent language programs in Sanskrit, Tibetan and Korean. Equally importantly, students are also expected to develop a firm methodological grounding in the Study of Religion. All students in the East Asian Religion subfield are required to take the Religion Department’s Theory and Methods seminar, and they are encouraged to work closely with such Professors as Robert Thurman (Indo-Tibetan Buddhism), Mark Taylor (Philosophy of Religion) and Courtney Bender (Sociology of Religion). In addition to the above resources, there are also a number of institutions at Columbia that directly support the study of East Asian Religions. Among the most important of these is the Center for Buddhism and East Asian Religions (C-BEAR), which has in recent years hosted a number of international conferences on such topics as the Medicine Buddha in East Asia, Medieval Shintō, Buddhism and the Visual Arts, Onmyōdō, and Shūgendō. These conferences afford students a special opportunity to meet leading scholars from around the world who are working on cutting-edge topics in the study of East Asian Religions. Often these meetings have led to ongoing academic relationships with specialists in the student’s chosen field of specialization. Where appropriate, advanced Columbia graduate students are also eligible to present papers at these conferences and publish their work together with leading scholars in their field in subsequent conference volumes. Further support for the study of East Asian Religions at Columbia is provided by the Donald Keene Center of Japanese Culture, which regularly sponsors lectures, workshops, performances and other events that bring prominent scholars, artists and other cultural figures from elsewhere in North America, Europe and Asia to the Columbia campus. Students are also invited to meet with leading scholars brought in by the Buddhist Studies Seminar at Columbia as well researchers invited by the Early China Seminar. The C.V. Starr East Asian Library at Columbia also provides students with daily access to one of the strongest library collections in the world in Japanese and Chinese literature, history and religion. Beyond the confines of Columbia, students also benefit from the University’s close connections with such institutions as the Japan Society, the Asia Society, the Metropolitan Museum of Art and the New York Public Library, all of which provide a wide variety of Asia-related film screenings, gallery shows, talks by writers and live performances by both traditional and contemporary artists throughout the year. The graduate program in East Asian Religions at Columbia brings together students and faculty from across the globe to their interests and areas of expertise in a dynamic intellectual setting. The Ph.D. program provides full funding (covering both tuition and stipend) for five years. The thriving M.A. program has trained many students to go on to Ph.D. programs and professional careers. Please contact the faculty by e-mail to learn more about the program.